Ronald Castagnetti received the Pitschel Prize for an expanded version of this essay in 2016. Growing up in Virginia and New Hampshire my parents instilled in my three brothers and me enjoyment and respect for creating edible gardens. We helped build a raised bed and cultivated various crops including tomatoes, corn, green beans, potatoes, carrots, squash, cucumbers, strawberries, and more. But I was the only child who appreciated the importance of weekly maintenance. I methodically weeded and removed pests by hand alongside my mother, who was pleased to no end, as she shared stories from her childhood in Hawai’i and the lessons, tips, and tricks she’d learned in her family’s vegetable patch. Today, more than three decades later, I’m living in California. After a meandering path through a variety of jobs I studied environmental horticulture at City College of San Francisco where, as a senior, I was part of a small team tasked with expanding and maintaining the Horticulture Department’s edible garden. Building, planting, cultivating, and harvesting more than 30 fruit and vegetable crops was so rewarding that now I want to share my experience so that others can benefit from similar positive, healthy, and delicious outcomes. I hope to empower people to start a garden on their own or encourage them reach out to a professional, like me, who can help them do so. Organic gardens of any type add biodiversity back into our urban environment and benefit the natural world. But organic edible gardens go even further and help to manage the health of individuals and their loved ones; it is a satisfying, therapeutic, and literally fruitful venture. Professional gardener Ronald Castagnetti works nitrogen-rich fava bean plants back into the soil. Keep an open mind and have fun. Tending an edible garden is an always-changing learning experience. Be prepared to dedicate time and effort and accept that you’ll make mistakes. Read books, do Internet research, take classes, or hire a consultant to assist you as you begin your garden. If you have space for an edible garden but don’t have the time to maintain it, outsource the work to qualified professionals. 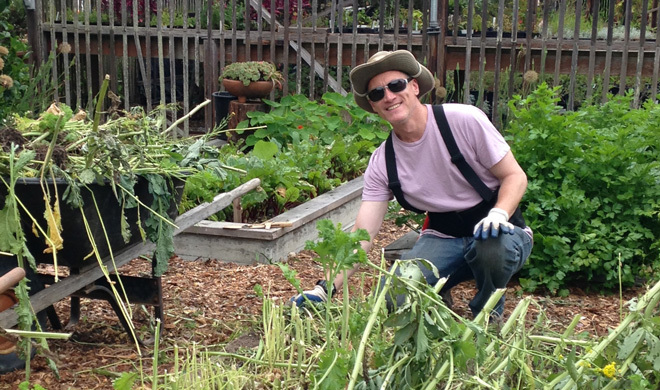 Community gardens offer growing space for those with limited or no land. Don’t take on more than you can handle or you’ll become overwhelmed and give up. Beginners are better off starting small—planting two to four crops is manageable. Don’t expect to raise enough food to provide for your household—think of the garden as a supplement to what you purchase from the grocery. Consider a soil analysis performed by a reputable lab to establish whether raised beds are needed to avoid contaminated conditions. 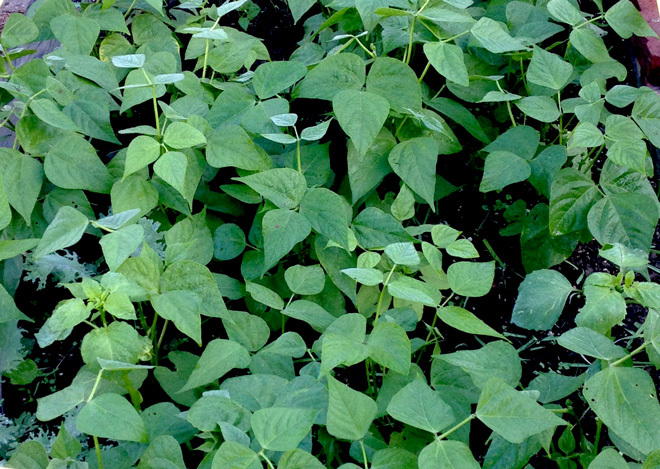 Refrain from using chemicals on your crops and rely on non-toxic pest controls. Select crops that are appropriate for your garden’s unique growing conditions. If starting plants from seed does not appeal to you, purchase organic fruit and vegetable starts at your local nursery. Since graduating in 2016, I divide my time between four part-time horticulture jobs. Three days a week I work as a landscaper for a residential garden business in San Francisco. I’m happy to report that in the past year we’ve installed several organic vegetable gardens for clients and are now providing ongoing maintenance and consultation. I also work part-time as the owner and operator of Phytophilia, my own landscaping company—the name means, “love of plants.” As a part time floral designer, a few days each month I work for a Bay Area catering company making beautiful flower arrangements for corporate and private events. And finally, I’m working in the horticulture department at City College where I am also pursuing a certificate in Floristry. It’s a busy life, but I’m comfortable in my new occupation that allows me to reconnect with enjoyable memories from my past.